Especially with decent sleeping arrangements, rail is by far my favorite mode of travel. There are many reasons for this. One is simply nostalgia for the days when it was the fastest mode of travel, with the sound of the engine and the uniforms of the conductors giving one’s trip the sort of glamour seen in North by Northwest or Murder on the Orient Express. Perhaps more important, the sense of journey and distance is tangible on a train. You see the land pass by next to you, you feel the constant forward motion and the gentle swaying motion of the car. The views are far superior to the sides of highways or the blankness mostly seen outside airplane portholes. Finally, there is the sense of luxury, in terms of time and space, that it offers. Air travel feels frantic and is filled with much queueing and stress. Train travel offers far greater space, freedom and flexibility than even first class air travel, the ability to get up and walk the length of the train, have a proper meal in a dining car, and interact with other passengers. Other than perhaps Europe, taken as a whole, or China (see my post of 2008.07.28), India is the greatest country/region in the world to explore by train. The network is extensive, covering almost all parts of the country other than the far north, and service is fairly frequent and reliable (although subject to delays at times). Especially given the relatively greater chaos and danger of Indian roads, the train is definitely the way to see India. That said, Indian trains are far from problem free. Yes, I acknowledge that the Chinese system has its problems, largely in the procurement of tickets (queues can be truly horrendous and the ticket agents impatient and at times surly), but Chinese trains are, largely, clean, fast and punctual. The Indian Railway has its own set of problems with ticket purchasing, and is, in addition, a bit dirty, somewhat slow and often delayed. Your first step in any Indian rail journey is, of course, buying the ticket. Nowadays, most tourists probably opt to buy tickets online, or through an agent that is connected to the online system. Although the system seems to have improved greatly from 2003, when it was something of a joke (we ordered tickets online only to discover when picking them up in the Delhi office that the order had been handwritten into a large ledger), we have had problems getting our credit cards to work on the somewhat confusing multiple “payment gateways” and have at times had to resort to more traditional methods, in particular to access the all-important “tourist quota” (more on this later), which is not available online. That said, online ticketing is generally extremely convenient (and can be done overseas, in advance of an India trip), and it is a service that is not even available in, say, China. The most traditional method, for a foreign tourist in India, is to use one of the “International Tourist Bureaus” located in the principal Indian railway stations, such as Delhi, Varanasi and Bombay. Now, these ITBs are pretty good, and are able to access the tourist quota, but there are significant queues of foreigners and service can be very slow. Also, the ITBs cannot solve the principal ticketing problem with Indian trains, which is that tickets are often unavailable. The oversubscription of transit in India is a bit of a puzzle to us, having visited many developing countries; Indians, however poor they are statistically, seem to have time and money to travel a great deal. Now, part of that is because people migrate into cities to work, as in China, and also because people travel to go on pilgrimage, an important aspect of Hindu religious culture, but I think the main reason is simply because they can, because tickets on Indian trains can be absurdly cheap. For example, the base fare for a 1000 km trip in Second Class (unreserved) is 175 Rupees (3.50 USD), or 295 Rupees (6 USD) in (non-AC) sleeper class (compare to 2420 Rupees (49 USD) in first class on a fast Rajdhani train). Another part of the Indian Railways ticketing puzzle is the quota system. There are numerous “quotas” for which spaces are reserved on the Indian train system, not only for foreign tourists but for all sorts of other categories of people (ladies, defense, parliament house, handicapped, etc.). Indeed, guidebooks suggest that there is *always* some sort of space available on an Indian train, if you can just persuade someone to dip into the right quota. Perhaps the most important quota, in addition to the tourist quota, is the tatkal quota, which reserves a block of seats until five days before the travel date for individuals who are purchasing tickets from the origin to the terminus of a given train. Almost as complicated as the quotas are the concessions (discounts) that are available for various classes of people, including people with various different handicaps, patients traveling for treatment, widows of wars and acts of terrorism, artists and athletes traveling to performances and competitions, etc. It is all quite byzantine. But perhaps the most bewildering aspect of Indian train ticketing for the foreign traveler is the ability to buy tickets without a reservation, in something called RAC (reservation against cancellation, which allows you to board the train and await placement into a berth) or WL (waitlist, which requires you to keep checking your status, up to the point of departure, to see if you’ve been confirmed a seat). Now, given the quota system, and cancellations, a person with a small waitlist number is almost certain to get seat/berth in the end, and we’ve relied on this system with some confidence that we will clear. But waitlist numbers seem to go into the hundreds! How can people buy waitlist tickets numbering into the hundreds for, say, a train trip that will last two days? Are people’s schedules really so flexible that they can just keep checking and show up to the station each day, to see if they’ve cleared? The complexity doesn’t stop there. Perhaps indicative of the stratified social structure in India, with huge gaps between poor, middle class and rich, long distance trains can have more than five different classes of travel, including unreserved general seating or Second Class, (non-AC) Sleeper, AC 3 Tier, AC 2 Tier and AC First (compare to Chinese trains, which only have three classes–soft seat, hard sleeper and soft sleeper). Even the waiting rooms are divided by class (and sometimes gender). As long as it’s not too hot, Sleeper class is a good way to go, with windows that open and just as much room as AC 3 Tier, at less than half the cost (though do keep in mind that Sleeper class can get dusty, especially on desert runs through Rajasthan). Most of the cars on a long distance Indian train (other than the special Rajdhani trains, which are all AC) are Sleeper class, as this is the way most Indians travel. If it’s hot, AC 3 Tier is the natural first choice. We think that AC 3 Tier offers great travel companions as well, often middle class Indians traveling with their families or well-educated younger people. Second Class riders may be the most entertaining, but AC 3 Tier riders probably offer the best conversation. AC 3 Tier comes with bedding (clean and comfortable, 2 sheets, a pillow with pillowcase and blanket), unlike Sleeper class, but is otherwise pretty much the same configuration (though with windows that don’t open). To go a bit more upscale, one can go AC 2 Tier. While AC 2 Tier offers more room (and, sometimes, more privacy in the form of curtains that separate each set of berths), we found that AC 2 Tier is often full of overweight, snoring, middle-aged men traveling for business–our least favorite travel companions. Finally, AC First, which comes in two- and four-person compartment configurations. To be honest, AC First is something of a mystery to me. Yes, the first class compartments do offer more room and privacy, but when booking AC First you are not assigned a berth until you show up for the train. This means that you have no control over whether you get a two-person cabin or a four-person cabin, and I’ve even had a three-person party split up between two cabins. I would certainly be willing to pay the >50% premium over AC 2 Tier if I were assured a private cabin for me and my travel companion, but if we end up being stuck with two strangers anyway, what’s the point? Although, I should note, that AC First doesn’t seem to have the problem that AC 2 Tier does–instead of overweight businessmen, you tend to get somewhat wealthier Indians on holiday. Enough about the various classes. Indian railway stations really deserve a separate post altogether–many horrible and amusing stories come to mind from our travels, the favorite of which is probably standing, right after having arrived on a redeye flight, on a NDLS platform with all sorts of cargo and sadhus performing morning ablutions while looking across the tracks and seeing a bunch of be-suited Indians on their morning commute–but a few things deserve mention. First, many Indian railway stations (especially those in the main cities built during the Raj) are architectural wonders. Second is the availability of cheap porters (get over any shame and give them some work, and tip well). 15 Rs (0.30 USD) for 40 kilograms–not a bad deal! Third is the sometimes incredible number of people sleeping in stations awaiting their next train. The first picture is from New Delhi Railway Station, while the second is from Calcutta Sealdah. Indian railway stations have all the modern conveniences, including urinals, lighting, fan and timetable display. I already mentioned the different entertainment provided by one’s carmates, but there are many other ways to entertain yourself on an Indian train than conversation, comfortable sleeping and eating the surprisingly quality meals. The first is, of course, enjoying the outside scenery. Not only are there wonderful natural landscapes, but passing through rural and urban areas one sees all sorts of things that are not otherwise visible (including, especially in the early morning, unfortunately, many people’s rears, as people like to defacate near train tracks, facing away). Most importantly, chai chai get ’em chai. Every once in a while, you will still see Indian milk tea being sold in disposable clay cups–but plastic is much more common. Now, I may have just called them beggars, but the way that hijra (traditional Indian transgendereds (see post of 2008.08.29)) operate, they’re hardly begging but rather demanding money as if by right. Fear of their powers made nearly everyone we saw give them money, although they often left us alone. Before ending this post, it would be negligent of me not to mention that Indian trains are notorious for theft and sexual harrassment. Lock your bags in the area near you or under the bottom bunk, and keep your most important valuables with you in your bunk (and never leave them unattended). On our very first train ride, we met a Canadian couple with a decade of India experience that had some of their most valuable belongings stolen by a well-dressed, articulate man who was “helping” them. (He tried to “help” us, too, but we were luckier.) Also, from what we hear, ifyou’re a woman traveling alone, there is a chance that you’ll wake up with a man’s hand somewhere you really don’t want it to be. Traveling in a higher class probably reduces this risk, but should you find yourself in this situation, be firm and shove away the hand and yell whatever comes to mind as loud as you can. Please note that this post focuses mainly on long-distance trains. On shorter daytime routes, such as that from Delhi to Agra, or suburban/commuter trains, there is a different arrangement of classes (generally, any class is fine). I will discuss the chaos of the Bombay suburban rail in a future post. We’ve had a handful of long bus, train and boat rides on our trip–going over the Torugart and Khunjerab passes, crossing the Taklamakan Desert, ferrying to Sulawesi, traversing the Balkan Peninsula, taking the COMANAV up to Timbuktu–but none has approached the chaos and uncertainty of the journey we just completed, from the Adrar to Nouadhibou on Mauritania’s famous iron ore train. The iron ore train travels a few times a day from Zouerat in north-central Mauritania to Nouadhibou in Mauritania’s northwestern corner (link to map), carrying blocks of iron ore in hundreds of cars that form one of the world’s heaviest and longest trains, usually around 2.5 km long. Once a day, the train carries a passenger wagon, which most tourists (and many locals) opt to take over the free alternative of riding in one of the iron ore wagons (on which the Rough Guide says that the dust will work its way into your soul). Well, this sounded like quite an adventure, and, needing to go from the Adrar to Nouadhibou, we thought we would go for a ride this world famous train. Our trip started at 8 AM in Chinguetti, a city of much peace and solitude that we were sorry to leave, when we caught a truck taxi for Atar, the main city of the Adrar, where we arrived a couple hours later. Atar being about three hours from Choum, the train’s sole stop between its origin at the mining city of Zouerat and its terminus at the port of Nouadhibou, and the train being scheduled to depart from Choum around 5 PM or so, we hung around Atar, using the internet and whatnot (there was no Internet in Chinguetti) until around noon, when we found another share taxi, this time to Choum. The ride from Atar to Choum is said to be scenic, but even with high expectations what we saw was exceedingly beautiful–stark and endless rocky desert, with the huge cliffs of the Adrar Plateau nearby, and scattered, isolated tents and settlements. There was no way that someone who didn’t know the region well could possibly find the route along a track that seemed to keep disappearing and re-appearing, perhaps because even our driver lost it now and then, to regain it further on. We arrived in Choum around 3:30 PM. Now, I didn’t expect Choum to be much–the only reason for its existence is as a service point for the iron ore train–but I did picture it as something like a town. No, it is pretty much a square–ringed with “restaurants” serving only tea and grocery stores selling only dry goods–surrounded by a bunch of ramshackle houses not so different from those in a sub-Saharan African village. There isn’t even a real train station, only a sort of shack as we would later discover. Surprisingly, considering that we were not in a big city or near the Senegalese or Malian borders, most of the residents seemed African, leaving us to wonder to what extent the current residents of the town had chosen to live there, or had arrived with some degree of compulsion from their employers (or masters or owners, given the supposed state of slavery in Mauritania, outlawed in 1981–yes, the eighties–but still persisting). When we first arrived in Choum, not finding any ticket or train office, we just waited around. Hungry, but not finding any real food for sale, we ate the bread and canned tuna that we had brought along, together with ginger-pineapple flavored Foster Clark’s, a powder drink bought from a local shop. We played with the children who were begging us for money (and later dug out from the garbage and licked the empty can of tuna to see what it was that we had been eating). We watched the local men play some form of lawn bowling. Others were clearly expecting to board the train–they had luggage–and so we figured that we would just follow their lead. Eventually, a man told us that the train was coming at 9 PM, not 5 PM, which made us sigh but, well, it was not as if we hadn’t been warned that the schedule of the iron ore train is far from fixed. The same man identified for us the ticket office, or rather the man in charge of selling tickets, and so we walked over and bought two, at around USD 10 each. The guidebook said that there were two available classes of travel–seats and berths–but the man didn’t mention anything of the sort, and offered only one type of ticket. We were told that the train was going to arrive around midnight, and that we should wait starting around 9 PM from a small white building on the horizon. And so it appeared that the train was already running seven hours late. When we left the office, a dark-skinned, heavy-set man indicated to us in extremely broken Spanish that we should come to his house for dinner. 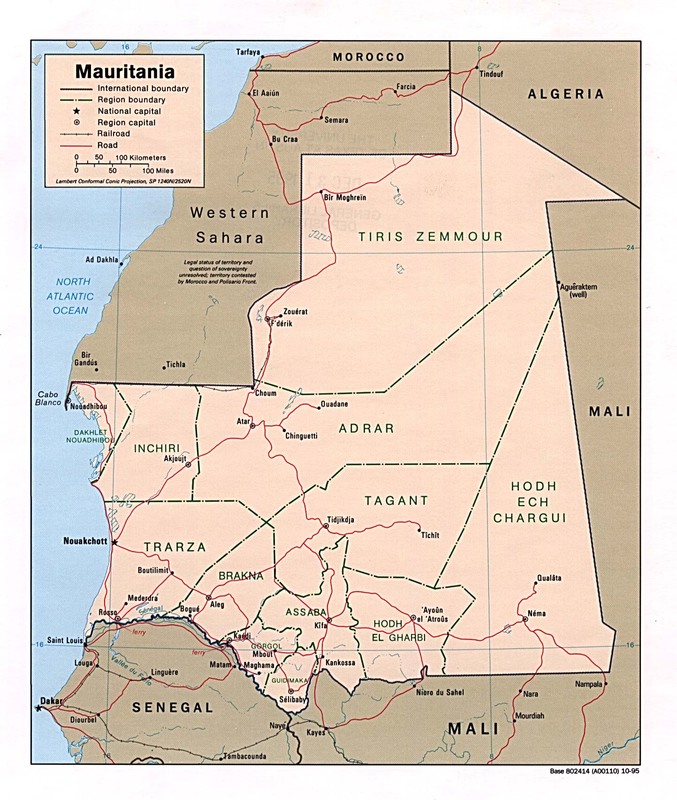 (The Western Sahara, at one point a Spanish colony though a much neglected one, is still a sort of Spanish-speaking region, especially among the native Saharawi, as opposed to the Francophone Moroccans who have settled in the region after after its occupation/annexation by Morocco in 1975). Every time he spoke to us in Spanish, presumably the only language he knew other than his mother tongue of Hassaniya Arabic, he would look at a little crib sheet, with a short list of Spanish vocabulary written in the Arabic script. We went over to the man’s house, and drank the tea made by his young son in the elaborate local fashion. To pass the time and minimize awkward silence we shared photographs from our trip that we had on our iPod with the man and his precocious son. There was much interest in the great architectural and cultural sights of the Muslim world, such as Cairo and Damascus, and we were surprised by how easily they recognized all of the key politicians of the region, calling out their names when they saw them. But the only pictures for which the man would have us go back? Photographs of women, which he would admire leeringly (we were told once that one reason that Muslim women dislike having their pictures taken is that they are afraid men will use them for some prurient end–and so it may be!). Our show and tell was interrupted by the sudden sound of a train outside. It was only about eight–four hours before midnight, when the train was supposed to arrive–but it was clearly here. We grabbed our bags and ran through the darkness for the tracks–not far from the man’s home–and then ran the couple of kilometers along the tracks to the small building where passengers are supposed to board. The darkness, our small flashlight and headlamp bobbing up and down, the frantic and sudden physical exertion, the sound of the endless train rushing past–it was nothing short of surreal. We made it to the designated place, and could see other passengers who had made it there by truck, but the train didn’t stop, it just rushed past. Now, there are supposed to be three iron ore trains a day, only one of which takes passengers, and so it made complete sense that there could be another, earlier train to pass Choum without stopping. Understanding that that is what must have happened, we went back to the man’s house. And good thing, too, because he had been preparing dinner for us. We sat down to enjoy a communal plate of pasta with a meaty stew, typically basic but hearty Mauritanian fare. Not wanting to experience again the mad dash to the train, we left shortly after dinner, and the man asked a friend to drive us over to the “station” this time, saving us the long walk in the dark. Parting, we offered the man a bit of money for our meal, which he accepted with much gratitude. We finally saw what that little white building was–a shed. With a dirt floor littered with broken bottles and crumbling ceiling and walls, it did serve as a shelter from the ferocious sand-laden wind that was blowing outside, but just barely that, as there were holes in the walls. There were eight or so other people–mostly young men–who were also waiting for the train. One of them told us that the train was expected at 1 or 2 AM. We made ourselves as comfortable as we could, lying on the dirt floor using our backpacks as pillows. One group of men boiled tea–Mauritanian men often travel with a full compliment of the tools necessary to make tea, including a teapot, fuel canister, tea, cups, etc–by building a small fire in the middle of the shed and using the hot embers to heat the pot. Gradually, everyone started to fall asleep. Around midnight, we all awoke to the sound of an approaching train. Everyone gathered their bags and rushed over to the tracks. It not being clear where the passenger car would stop, we jumped on to a couple of trucks that had been hanging about, so that the driver would drive us over to the right car. But again, the train simply rushed past–another false alarm. We trudged back to the shack, and went back to sleep. Finally, around 3 AM, about ten hours past the time we had originally expected, the train came. Boarding was, as we should have expected, a fiasco. With only one real passenger car already packed with men filling the aisle alongside the six-person compartments, most of which had more than six passengers, it was not at all clear where we could go. Finally, someone squeezed us in into a compartment that was not yet overfull–we had to push aside the current passengers, who were somewhat sprawled about and initially unwilling to yield any room, but we pushed and shoved ourselves enough room on the bare wood seat (the cushions were no longer in place) to pass the night. Any upsetness over our squeezing into their cabin had mostly evaporated by morning, and it was a jovial ride to Nouadhibou. The train would start and stop with no apparent cause, and it was clear that we were running many hours behind, but no-one had been expecting to arrive on schedule. When the track turned south from its generally westward course, we knew we were getting close. We were about twelve hours behind schedule when we reached the 43 kilometer mark, at which some passengers hopped off and we passed another iron ore train, and arrived at Nouadhibou around 7:30 PM. Sheep and humans can ride for free on the iron ore wagons.